Happy Monday! I wanted to share a quick update with a few reviews that I meant to get up this past weekend except I was getting over a cold. Apologies that many items are sold out but sizes always pop back once people receive their items and make returns. 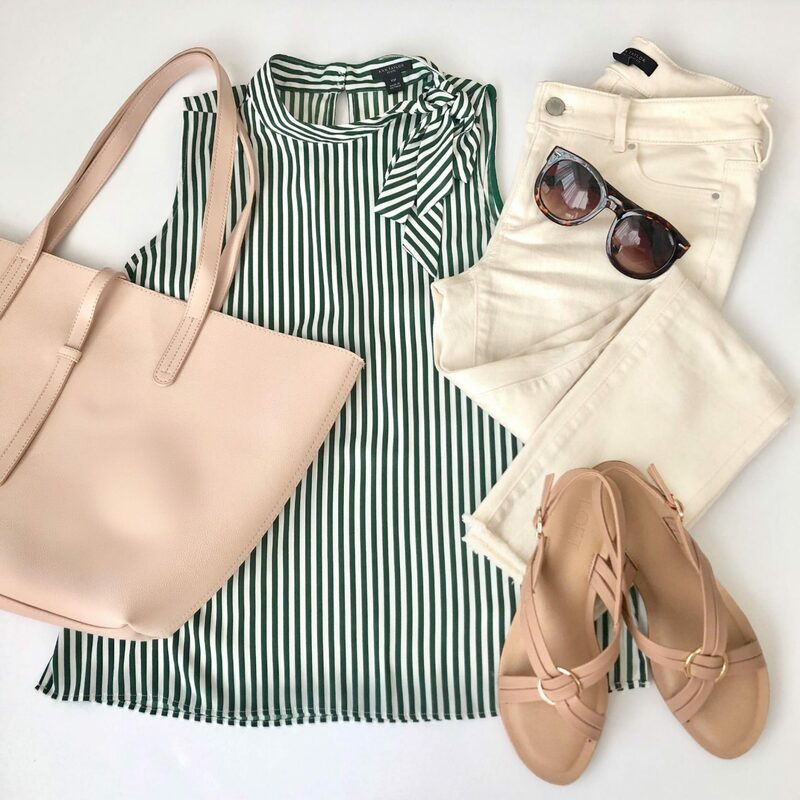 If you follow me on Instagram stories, check the sale alerts page or referred to my Insta Shop then you may have already taken advantage of this weekend’s sale at Ann Taylor which allowed two codes for huge savings! 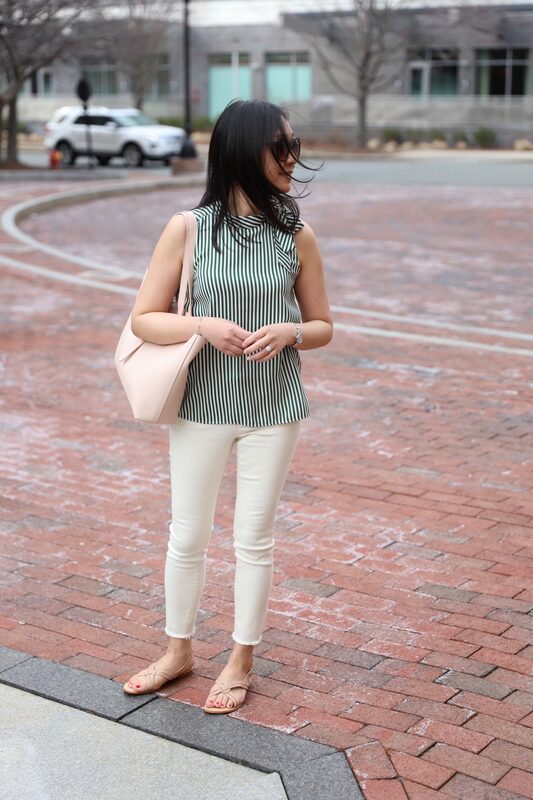 You can still get 40% off + extra 10% off at Ann Taylor with the code HELLOSPRING until 3AM ET tonight. Update 4/9: This sale is over but you can always catch the latest sales and codes here. You can also stack code THANKS7 for an extra $50 off your full-price promotional purchase of $100+ since the shopping cart allows two codes at checkout which hasn’t happened in a long time! Usually the cart only accepts one code at checkout. Lastly I used ShopRunner for free 2 day shipping on orders of $25+ and cardmembers now get free shipping on orders of $75+. I linked to a few of my favorite sales picks here which is one of the orders I placed. If you see the prices I got for the items in my order then you’ll notice it’s 72.6% off retail! I ended up placing 3 small orders this way. Refer to all of my Ann Taylor reviews here. 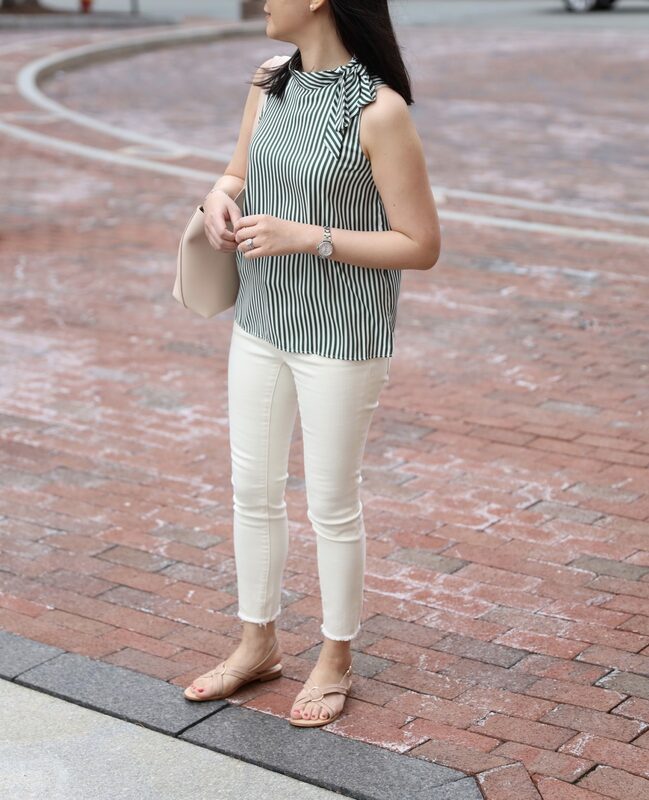 This striped top is one of my favorite recent purchases and I took my usual size XSP. I love the mock neck which is looser and pretty bow to one side. I was curious about how it was tied so I tried to undo the bow but it’s sort of stitched together so my efforts were thwarted. I actually couldn’t put the bow back exactly the way it was looped but I did my best. 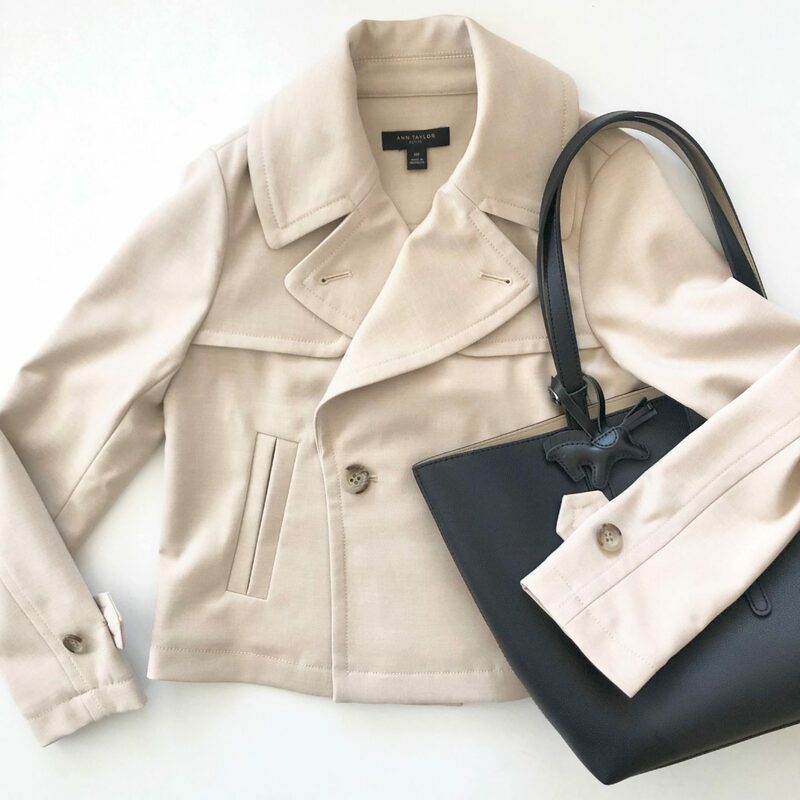 I thought I was smitten with this swingy trench coat but the more I tried it on the more I felt that the collar was too big for my smaller frame and small chest. I may regret it later but I ended up returning it. I may buy it back later if I still want it. The material and texture is similar to dressy suiting instead of the usual cotton trench so it looks more dressy than casual. It also comes in pink here. It has functional pockets but I didn’t free them or the pleat in the back. Size 00P fit like my usual size 0P. The measurements of size 00P are: 13.5″ shoulders, 33.5″ chest, 23″ sleeve length, 12″ upper arm circumference, 20″ total length and 38″ along the bottom hem. I was excited about this striped cardigan but I found that it’s really thin so I wasn’t sure it justified the price so I returned it for now. It also has with a matching striped shell which I haven’t seen in person yet. I’m usually size XSP but I had sized up to SP for a relaxed fit and so that I could have the option of buttoning it without the buttons gaping. 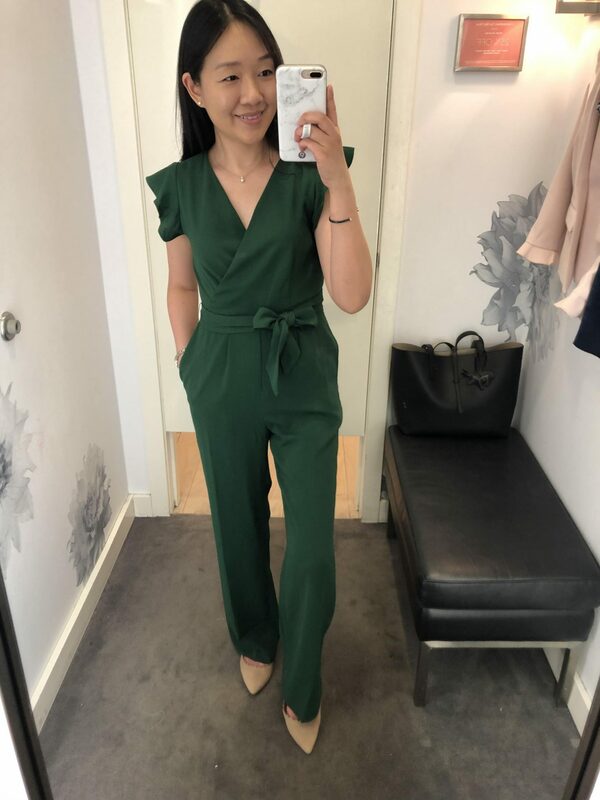 This Kelly green jumpsuit is stunning in person but size 0P has a 28″ inseam so it would require hemming or higher heels. I’m 5’2.5″ and I’m also tip toeing in the above photo. 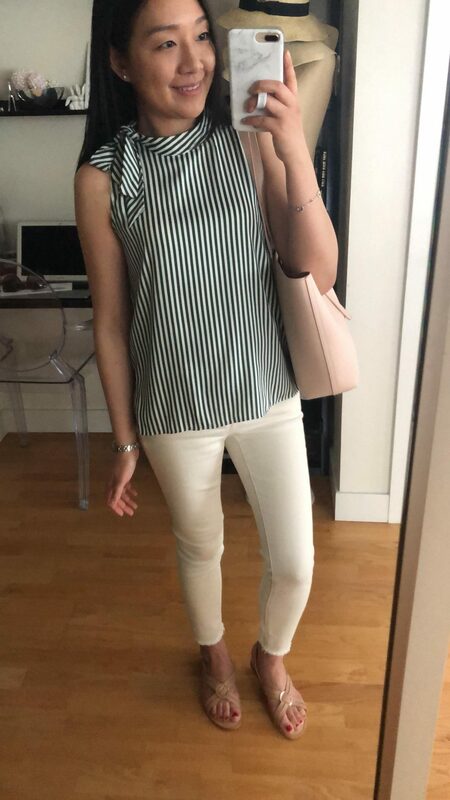 It fits true to size but the petite torso felt a bit short waisted on me since I could feel some slight pulling at my shoulders. There is no hidden snap button to keep the wrap portion more secure but it’s not too open that you need to wear a cami. If you have a larger bust it should fill out the wrap portion to keep it modest or you can always use some fashion tape. Click here to see it without the sweater underneath. I wanted this pink jacket after trying it on in store but at the time it wasn’t the best sale price so I passed on it. Hopefully my size and color pops back if someone returns it so that I can snap it up during the next sale. It’s still available in some sizes in classic black. My usual size 0P fits true to size with room to layer. Thanks L! I hope I can find the perfect cropped trench but thanks for your thoughts regarding the size of the collar. I am not curvy and consider myself to have a straight figure with minimal curves but I noticed that the rise is sometimes more comfortable in the curvy fit. The crotch can fit me funny in the modern fit as was the case for these frayed ecru jeans so the curvy fit worked out best especially at the knees (the modern fit had baggy knees on me). I really appreciate your feedback regarding my video clips. I’ll try to remember to turn around especially for the shoes or provide a back picture view. Some shoes I end up changing my mind about because they don’t look nice from the back so I can understand your ask. Thanks again for checking out my reviews!